Stats: Height 31.3 in (90%). Weight 21.61 lbs (32%). Head 18.4 in (63%). Favorite Foods: Pasta (particularly pesto pasta or orzo), cottage cheese, & greek yogurt. He loves to use utensils but is still somewhat uncoordinated with them. We give him a preloaded spoon or fork most of the time, but he is becoming more insistent upon scooping his own stuff. These days are messy! Words: Mama (sometimes Ma), Dada, & hot (with the "t" emphasized). Absolutely everything is HOT right now, he says this word all day long. Favorite Toy: Janod Multi-car Truck (he attempts to use it as a pull toy but ends up dragging it around, and he loves to just carry the cars around the house). Favorite Books: Tails (he loves the flaps, tabs, and different textures) & I'll See You in the Morning (he loves the illustration in this book best)! Favorite Songs: Blurred Lines (this is his dance jam) & If All of the Rain Drops... (when Mama sings it). Favorite Activities: Dancing (anytime he hears music, his starts bouncing his little legs to the beat)! Climbing the stairs (he loves going up & down continuously). Being chased (and chasing Conor or I). Bath time (he'll even climb into the tub during the day with his cloths on). Trips to the zoo (he tracks the animals pretty well, and likes to people-watch too). Riding the carousel (we have such a hard time getting him off the ride; he never wants it to end). Least Favorite Activities: Diaper changes (I still put him on the changing table because he can too easily squirm away from me on the floor or bed). Car rides (not a huge fan of the car by any means, but he does okay when he has a pacifier because the car is only place he gets it). Sitting in his high chair (when he is done eating he wants out immediately, he simply has no time to sit around in that thing). Sleep Schedule: He still sleeps in our bed for now; this is what currently works for our family and is how we maximize our sleep! He roughly sleeps from 9pm-8am, still waking up every 2 -3 hours. I think we are in the process of going from 2 naps down to 1. This has been a challenge for me, because some days I have no idea if I should be pushing him to take that 2nd nap or not. Some days he does fine with 1, but other days he'll take two long ones and still manage to fall asleep in the car while we're out & about. I'm still figuring it out, and I think Liam is too. 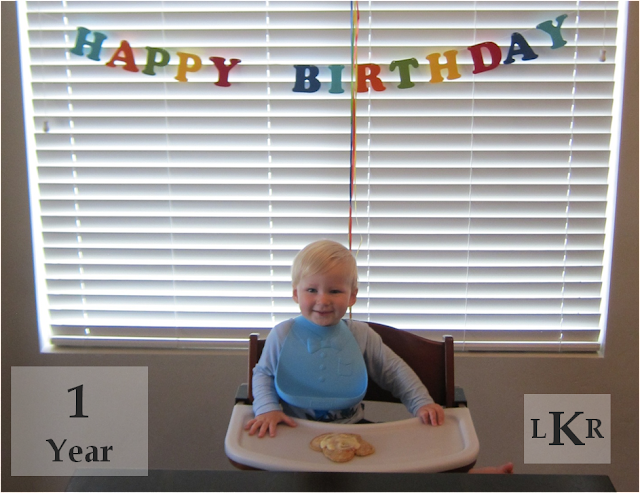 Thanks for sharing Liam's 1st Birthday! Glad to hear that it went so well, and he enjoyed his cupcake! Thanks for sharing Liam's 1st Birthday!! Glad to hear it went so well and he enjoyed his cupcakes! He is so cute! Happy first birthday, little dude!